(Family Features) Crisp, juicy and sweet, grapes are a real crowd-pleaser. Even better, all three colors of grapes -- red, green and black -- are good for you. Grapes are a natural source of beneficial antioxidants and other polyphenols. Current research suggests that grapes may help maintain a healthy heart, and may also help to defend your cells against a number of age-related illnesses. 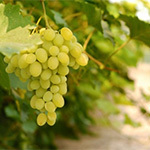 Scientists are also working to uncover more links between grapes and eye health, brain health, joint health, and more. At just 90 calories per 3/4 cup serving, grapes are a sensible, delicious snack with no fat or cholesterol. Layer -- California grapes are juicy, nutritious and beautiful in breakfast parfaits. Roast -- Just like when you roast vegetables, grapes also caramelize, yielding a flavor that is wholly unique. You can top your dish with roasted grapes as is, or turn them into a luscious sauce. Grill -- Oh yes! You can thread them on a skewer with other fruits, like pineapple and mango, vegetables, fish, meat and poultry. Grapes can handle the heat, not only from the coals, but also from a spicy marinade or rub. Clip -- The best way to present grapes on a fruit platter or as a (truly edible) plate garnish is to clip them into smaller clusters. Grapes provide height, coverage, color and simply great taste. Dip -- Rich chocolate -- dark, milk, white, flavored -- and grapes make a delightful pairing. Grab-and-Go -- Pack them up for a snack or as an accompaniment to sandwiches and wraps. Here is a selection of recipes that show how grapes can add flavor, texture, color, and nutrition and health-promoting properties to appetizers, salads, and sides. Note: Sometimes when a recipe seems too "healthy" to appeal to picky eaters, grapes have a way of making these preparations taste better and look more appealing. According to research from the University of Connecticut, funded by the California Table Grape Commission, eating grapes may help protect heart health in men with metabolic syndrome. In the study, men with metabolic syndrome who consumed grapes lowered their key risk factors for heart disease. Metabolic syndrome is a cluster of conditions that occur together -- high blood pressure, high blood sugar, excess abdominal fat and increased blood triglycerides -- significantly increasing the risk for heart disease, stroke and diabetes. Soak long bamboo skewers in water for at least 5 minutes. Thread skewers with 2 shrimp, 6 grapes and 2 onions, with a ribbon of prosciutto winding throughout. Place the finished skewers in shallow dish or plate. To make marinade, whisk together garlic, vinegar, rosemary, salt and pepper and gradually add the oil. Evenly dab on half of marinade with a brush. Let marinate in refrigerator for at least 30 minutes and then brush with remaining marinade. Grill on a hot fire for 2 minutes per side. Serve immediately. Black pepper Bring 2 cups of water to a boil in a medium saucepan. Stir in bulgur and 1/2 teaspoon salt and remove from heat. Cover and let stand 20 minutes or until most of water is absorbed. Drain well and press to extract any excess water. Let cool and stir in the remaining ingredients. Season well with salt and black pepper. Serve room temperature or chilled. 1 1/2 cups julienne cucumber In small bowl, combine cornstarch and water. Add chicken broth, sugar, vinegar, chili paste and soy sauce. Set aside. Heat oil in large nonstick skillet over high heat. Add garlic and ginger; sauté for 30 seconds. Add chicken and cook until no longer pink, about 5 to 8 minutes. Add grapes and green onions; sauté for 30 seconds. Restir the sauce mixture and pour into skillet. Stir until thickened, about 1 to 2 minutes. Remove from heat. Place chicken mixture in lettuce leaves; garnish with cilantro and cucumber. Serve open or roll up if desired.